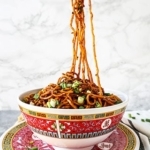 An easy Chinese noodle dish for Asian food lovers. In a small pot over high heat, add broth, soy sauce, sugar, cinnamon stick, star anise and Sichuan peppercorns. Bring to a boil, lower the heat to low and simmer for 15 minutes, uncovered. Strain the sauce into a large bowl and set aside. Throw away the solids. In a small blender, add peanut butter, rice vinegar, sesame oil, ginger and garlic and blend until smooth. Pour the mixture in the large bowl and whisk with the sauce. Set aside. Cook egg noodles according to directions on the package. For fresh lo mein noodles, boil for 5-6 minutes. Drain and rinse under cold water. Drain well and transfer eggs noodle to the bowl. Toss well until the noodles are evenly coated with the sauce. Top with scallions and serve with chile paste and rice vinegar.